Thinking About Getting Divorced in Washington? The decision to get divorced is really about making a choice about what is best for your family. In some cases, the best way forward for you, your spouse and any children you have may be to separate. However, even if divorce will help you in the future, it is always challenging process, especially if you have been married for some time. The stress and emotional turmoil can make it even more difficult to answer the complicated legal questions that you will encounter. 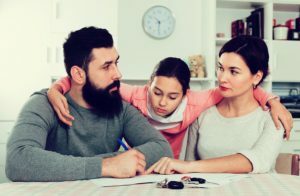 Questions about asset division, child custody and support, and/or alimony can be tough to settle, even if you are on amicable terms with your spouse. Therefore, while you do not necessarily need an attorney to dissolve your marriage, consulting a Washington divorce lawyer can help you navigate the divorce process more quickly and smoothly. If you are considering divorce or were served with a petition by your spouse, then an attorney can help you understand your rights and options. Below, our local Washington family law attorneys explain the general steps of the divorce process and discuss common issues you may encounter. However, every situation is different; a lawyer can examine your situation and explain how Washington divorce laws apply to your unique circumstances. If you are considering divorce or received a divorce petition, then you should contact a family law attorney as soon as possible. To find a divorce lawyer near you, consult our local listings. Alternatively, if you have a question about family law, divorce or child custody/support in Washington, then do not hesitate to ask the lawyers.